According to the U.S. Environmental Protection Agency, a common class of airborne toxins known as Volatile Organic Compounds (VOCs) is ruining indoor air quality, and causing some U.S. homeowners to become dizzy, asthmatic, and ill.
VOCs are gases emitted by certain, common household products, including paint and paint strippers, cleaning supplies, and copiers and printers — even when the aforementioned products aren’t in use. You can find VOCs “everywhere” because organic chemical compounds have become essential in everyday life. VOCs are what give cars that “new car smell”. They’re also the cause of “Sick Building Syndrome“. As a homeowner in Murfreesboro , VOCs in your home can make you sick. Therefore, the EPA advises homeowners to take the following steps to reduce VOC levels in their respective homes and improve and home air quality. When using VOC-emitting products such as paints and paint thinners, keep a well-ventilated home. 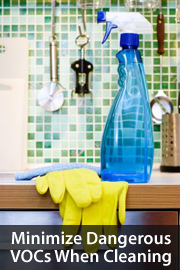 Avoid purchasing cleaning supplies or paint in bulk. Buy only what you need. Never mix household cleansers. It may yield unintended results. Throw out “dry cleaning bags” as soon as possible. Most dry cleaning makes use of harmful VOCs. Do not burn tobacco products inside your home. There are a half-dozen other recommendations, too. They’re listed on the EPA website. You can’t remove VOCs from your home, but you can minimize their negative effects. And keep your household as healthy as possible.